Otome Elisha, PhD, is currently a research scientist in Georgetown University. He loves chemistry with a passion. In his spare time, he enjoys teaching and writing, short stories, motivational writings and especially poetry. Denise Grindstaff has a degree in Human Relations from Southern Nazarene University, Bethany, Oklahoma. She is passionate about cross-cultural exchange and loves to travel. Denise enjoys being in nature, reading, hiking, and having inspiring conversations with old friends and new around her dining room table. She lives in Fayetteville, Arkansas, with her husband and three boys. 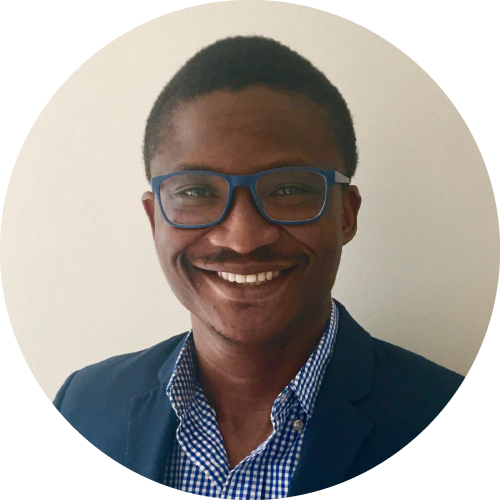 Kola is an organic chemist that loves to leverage his unique blend of technical and communication skills to deliver outcomes for business stakeholders. He is also passionate about personal development and continuous learning. He is currently a senior scientist with Sealed Air—a knowledge-based company, delivering outcomes that create outstanding value for customers. Kola obtained his doctorate from the University of Arkansas, where he developed methods for making a variety of small organic molecules that are commonly found in medicines. He is a recipient of several leadership awards including, the Younger Chemists Committee Leadership Development Award, issued by the American Chemical Society, and the Love of Learning Award, issued by the Honors’ Society of Phi Kappa Phi. He is based in Charlotte, North Carolina, where he lives with his beautiful wife Tolu’tayo, and two kids, Folajoba and Foladara. James Woodard is an engineer and businessman. Based out of Houston, Texas, he currently serves as an engineering manager at a technology company serving Fortune 500 clients in the energy sector. He has varied interests in the STEM, business, psychological, and sociological arenas. His hobbies are primarily dedicated to his personal development and the development of others. Camille Womack is a B2B marketing professional specializing in branding, content, social media, website, and search engine optimization for businesses in the software industry. She holds an M.A. in Publishing & Writing from Emerson College and is passionate about good communication, problem solving, and great writing. Bo is an interactive designer based in Baton Rouge, LA. She has a degree in graphic design from Louisiana State University. She currently works for a full-service agency called ThreeSixtyEight that specializes in strategy, branding, marketing, and advertising.